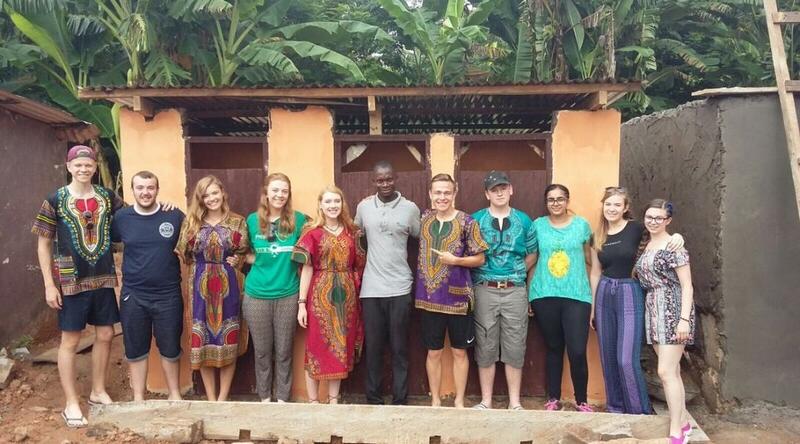 When I arrived in Ghana to start my Projects Abroad placement I thought it would just be the physical act of building some classrooms for a local school that would benefit the community. Two months later, as I was coming to the end of my placement, I began to realise that it goes much deeper than that. Yes the volunteers provide welcome helping hands on the building site enabling the projects to reach completion before the rains come and wash any unfinished structures away, but the projects would not be possible in the first place without the money coming from volunteers' fees through Projects Abroad. These not only help to supply tools and materials to the building site but extend beyond the building site into the communities we are placed in. For a rural family reliant on agriculture and market forces to make a living a steady income from taking a volunteer into their home can also make a real difference to their lives, as can the seemingly small amounts of money the volunteers themselves bring with them and spend in the community. But it is more than the material and financial gains of taking volunteers into a community that have the most profound effects, it is a subtler cultural exchange that takes place. For so many Ghanaians that I met in the Akuapem Hills where I lived the simple knowledge that people from the 'white world', who in their eyes are rich beyond their wildest dreams, actually want to visit and support their community is more valuable than all the mud bricks we could ever make. What I don't think they realise is that the exchange works in both ways. I had a fantastic time in Ghana; I met some lovely people and was constantly impressed by the friendly and ever helpful nature of Ghanaian people. Life was so much simpler than life back home, people were not stressed and certainly there was no such thing as the rat-race, it was too hot for a start, so everything just got done in its own time. Life itself was not perfect but it was precious and to be enjoyed. The children, although they often worked hard within their family unit, also had wonderful imaginations and loved to tell stories and listen to our accounts of lives in a world so different to their own. It was a little bit strange to always be the centre of attention, to have people calling 'Obruni, Obruni' (white person) across a crowded market at you and to have children just wanting to hold your hand and be acknowledged but it was also very welcoming to the point that I never felt like an outsider. The majority of children in our area went to school but they still lacked many resources and are mainly taught by rote with little time for young imaginations to take flight. Most of the children had no access to books at all and yet they were fascinated by them and whenever a volunteer sat outside to read, even something as simple as a guidebook we would immediately be surrounded by eager onlookers all poring over the pictures and attempting to read a few lines aloud. As the classrooms we were building neared completion I felt I still wanted to give something more in return for all that Ghana had given to me. So when the Reverend (my host father and a local community leader) told me of their plans to build a community library I knew I had found my next project. At the moment I am back home in the UK running a fundraising campaign to try and raise the money to build the library and collect books to stock it. Already the foundations have been dug and concreted, but there is still a long way to go. I hope to return to Ghana with Projects Abroad in July for a few weeks, provided I have raised sufficient funds, to help finish the library and see the books I am collecting delivered to their new home. I am really looking forward to going back out there, seeing my host family and all the children again and taking in some more of the Ghanaian culture. If you are still considering whether or not to do a volunteer project I would highly recommend it, then go out to your chosen country with your mind open to the new experiences and soak up as much of the experience as you possibly can.